Millions of people have dogs and cats for pets and love them dearly. However, keeping your New Port Richey, Florida home clean with a pet or two in the family can be a challenge. Pet hair, dirt, muddy paws and accidents are all a fact of life when you own a dog or cat. Here are a few ideas to simplify keeping house with pets. Only allow your pet into certain rooms of your home to contain dirt, hair and messes to a small area rather than let your cat or dog roam freely. 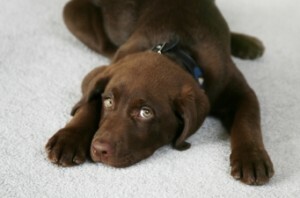 For example don’t allow your dogs into the carpeted areas of your house. This will keep the carpets clean much longer and prevent any accidents on harder to clean carpet. It’s not very difficult to teach your dog that they are not allowed on the carpet and they will soon be happy to have the run of the rest of the house. Some people only allow their dogs into a certain room of their New Port Richey, FL house, the mud room for example. This makes the daily task of sweeping quick and easy because it’s only a small space. You can keep the doors closed to that room or use a child’s safety gate to keep your pet contained. Keeping bedroom doors closed will keep the cat out if he or she loves to sleep on the beds when you aren’t looking. They do seem to prefer to sleep in the same spot most of the time leaving dirt and hair behind. Crate training your puppy is another solution to containing your pet’s mess and some dogs actually seem to prefer their crate as a comfortable safe haven. An older dog might not feel the same way being introduced to a crate later in life. Another solution is to have your dog’s bed near the door so when he or she comes indoors they can curl up on their bed, this works especially well if they are wet, have dirty or muddy paws. They can stay on their bed until they have dried off and are cleaner. By having your dogs go directly to their bed when they come inside from outdoors any dirt and hair is pretty much contained in their bedding. Depending on the weather and your location their bedding will need a quick shake outdoors regularly and washing every week or so. Stop dirt at the door! Before your pet has a chance to run through the New Port Richey, Florida house leaving muddy tracks use an old towel to wipe muddy paws at the door. If paws are really muddy or have winter salt on them rinse them in a small bucket of warm water and dry them with an old towel. Or try pet boots, your dog might not like them at first but will get used to them. If your dog or cat prefers to sleep on your bed or upholstered furniture cover their favorite nap location with a towel or small blanket that can be easily washed. This works well for cats and small dogs who always have their favorite perches for keeping their eye on things and napping. Pet accidents do happen and there is a variety of products on the market to deal with these. Look for one that will eliminate both stains and odors to prevent a repeat performance in the same spot. Taking a bit of time to train your pet, some advanced planning and preventative measures will make keeping your New Port Richey, FL home clean with pets much easier and less time consuming in the long run.